Journal Article Review – Clinical Application of MultiColor Imaging Technology | Heidelberg Engineering Ltd.
Reticular pseudodrusen and small hemorrhage (bright red in the MultiColor image) in AMD. 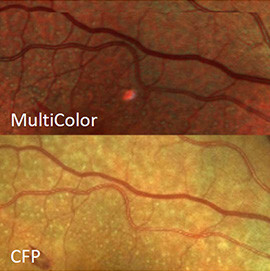 MultiColor is an innovative technology for fundus imaging offering structural detail and clarity not available from traditional fundus photography. Read in the article review how confocal MultiColor imaging, uses three laser wavelengths simultaneously to provide diagnostic images that show distinct structures at different depths within the retina with high resolution and increased contrast. Most studies to date have been limited in scope in describing the utility of MultiColor for specific (epi-) retinal pathologies. This paper however describes the detection of a wide range of sight-threatening retinal pathologies in MultiColor images, and compares the findings with CFP and other multimodal imaging techniques. MultiColor is an optional module of the SPECTRALIS® multimodal imaging platform. As such it can improve the workflow efficiency in high-volume clinics while offering advantages to smaller clinics where budget and spatial constraints only allow for limited imaging equipment.